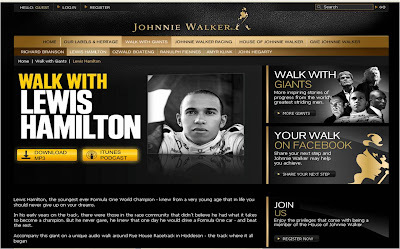 A series of celebrities including Richard Branson, John Hegarty, Lewis Hamilton and Ranulph Fiennes are featured, with users able to watch a video trailer and then download a 20 minute audio walk interview. All of this can then be shared on Facebook with users able to share thoughts and feedback with the Johnnie Walker Facebook fan page at www.facebook.com/JohnnieWalker. Nice way of bringing a 'walk' to life!